As Deputy Scientific Director at Fox Chase Cancer Center, Dr. Clapper is responsible for fostering collaborations with faculty in the area of population science and identifying opportunities to enhance research interactions and funding across Fox Chase's scientific programs. A professor and longtime faculty member at Fox Chase, Dr. Clapper also serves as co-leader of the Center's Cancer Prevention and Control Program. In 1991, she created one of the first basic research programs nationally to focus on developing strategies to reduce cancer risk among high-risk individuals and promote early detection and prevention. At the time, the idea of preventing a disease like cancer was not widely accepted. The program has since grown under her direction and has broadened its work to include prevention research focused on colorectal cancer as well as lung cancer, with a strong interest in and pursuit of translational opportunities. First report that the lung can metabolize estrogen extensively. Its conversion to 4-hydroxyestrogen, a putative carcinogen, is accelerated in mice exposed to tobacco smoke. Early detection of colorectal tumors in Apc+/Min-FCCC mice using endoscopic examinations (panel A) and infrared bioactivatable probes specific for matrix metalloproteinases (panel B) has provided new insight into the growth characteristics of preneoplastic colorectal lesions. The presence vs. loss of p53 drives the formation of polypoid and flat colitis-associated colorectal neoplasms, respectively. The morphological subtypes also vary in their response to therapeutic intervention; a critical factor for consideration during chemopreventive agent development. This program, initiated more than 20 years ago, is one of the first basic research programs nationally to focus on cancer prevention. Its overall goal is to develop novel, efficacious preventive regimens for individuals at high risk for cancer. Projects focus on the identification of early molecular alterations that may serve as biomarkers of cancer risk and targets for therapeutic intervention in colorectal and lung carcinogenesis. All research is highly translational, with experimentation spanning from cultured cells and genetically defined animal models to the analysis of human tissues. 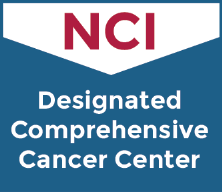 Application of state-of-the-art genomic and imaging technology to the analysis of well-defined mouse models continues to provide unique insight into the molecular basis of the carcinogenic process and potential strategies for tumor inhibition. A major interest of the lab is to improve our ability to detect colorectal tumors early and establish regimens for the prevention of colorectal cancer in both subjects with known genetic risk and patients with inflammatory bowel disease. Scientific advances have been facilitated by the generation of a mouse strain (Apc+/Min-FCCC) that uniquely develops spontaneous colorectal tumors at a high multiplicity. This model has been used extensively to test agents for their cancer preventive activity and develop image-based probes for the detection of early neoplastic colorectal lesions. Analyses of the molecular mechanisms underlying colitis-associated neoplasia have led to the discovery that morphological subtypes of dysplasia arise via distinct genetic mechanisms and respond differently to therapeutic intervention. The lab’s interest in hormones and lung cancer has led to the recent novel discovery that: 1) estrogen and its metabolites are present within murine and human lung tissue at detectable levels; 2) tobacco smoke induces the expression of estrogen-metabolism genes and the production of a putative carcinogen, 4-hydroxyestrogen, within the lung; and 3) estrogen metabolism varies with race among women. The group has extensively characterized the estrogen metabolizing capacity of human tissue from lung cancer patients and established an aerosol delivery facility to expose animals to environmental pollutants, including tobacco smoke and e-cigarette vapor, under tightly controlled conditions. This Fox Chase professor participates in the Undergraduate Summer Research Fellowship. Learn more about Research Volunteering.